This blog continues the series on Digital Games and Learning. Today’s blog looks at a great use of iPads at the Australian National Museum. The first key element is that its a race. Teams work against the clock, and each other, to make connections between objects in the museum, and describe the connection in a word or a phrase. The game happens fast! Second key is that its collaborative. Each group has one iPad and the group has to make decisions and make them fast. At the start, the group has to give itself a name and take a photo to identify itself. You quickly find out as youplay that the person holding the iPad is all powerful – and under a lot of pressure from the team to photograph and type quickly. Key three is that is creative. It is unlikely that the game would ever play out the same way. At the start of the game the teams are given the starting object for the game. Its the same for all teams. The game I played, the starting image was the massive bucket of a dragline used in mining. The bucket was in the museum, so the first thing we had to do was find it. Easy! The bucket was big, and we were told which gallery it was in. Key four was making connections. Having the starting object, each team then needs to find an object that can be connected in some way to the starting object. The connecting can be as close or tenuous, however the team chooses. For example, in our game one team chose a nearby taxIdermied Quokka (possum like animal). The connection they made was the environmental destruction caused by mining. Key five is it’s hands on. When the team has found their object, they photograph it with their iPad and describe the connection. The finding and photographing is all done in a tight timeframe. Key six is the review process. Once all connections are in, each team rates each other team’s selection. This all happens within the app. Key seven is it’s competitive – there’s a leader board. The ratings from the last step are used to score which teams’ photo selections were best. The top selections appear on everyone’s ipads as the next set of objects the teams must connect with. With the starting photo of the mining bucket for example, the most popular connections might have been Quokka, Gold nugget, and water bucket. Key eight is its visual. The results of each round are shown on all teams iPads as a slowly growing network of objects. It is like a museum mind map. Key nine is that it is an inquiry learning process. students are making connections themselves. It is self directed within the structure of the game. Key ten – learning happens and it’s fun. To play the game students need to take a closer look at the objects and see what they are. I noticed as the game progressed, teams made their selection on what was popular – and the favourites showed great humour. More and more the brain was thinking of funny connections as it surveyed the objects, looking for items to connection that might be funny. There’s lots of laughs. In the process, kids playing are seeing and learning about the objects so they can make a connection that gets a top score from their peers. It’s a great learning app. Well done to the team at the National Museum that created it. If you are taking a school group to visit Canberra, definitely go to the National Museum and play The Museum Game. For more infomation click on the Museum Game site, National Museum Australia. The previous blog in the series was about the learning beyond iPads, with ‘Of Angry Birds and Airports’. 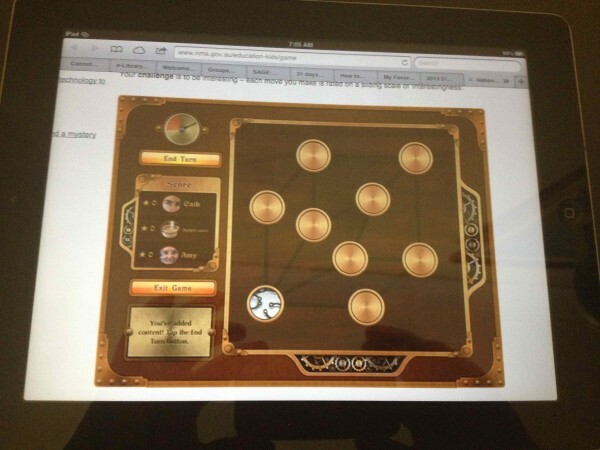 The next blog continues looking at ipads and games in museums.